Jump City’s Disney’s Little Mermaidl Ariel is breath taking! 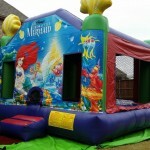 This pretty, beautiful Little Mermaid bounce house is for the loving, bright gems in your life. 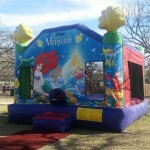 Bright and happy this beautiful bounce house has Ariel and her friends in a watery wonderland just waiting for your daughter and her friends.This genuine Disney Art work and licensed, approved jump house is a classic and ready for your children’s Party, or event. High quality construction, safety step and safe netting to keep kids inside and so you can see your children from every angle. Rent one for your party today! Call now for your Dallas, Plano, Frisco, and all areas in between – we deliver on time every time!